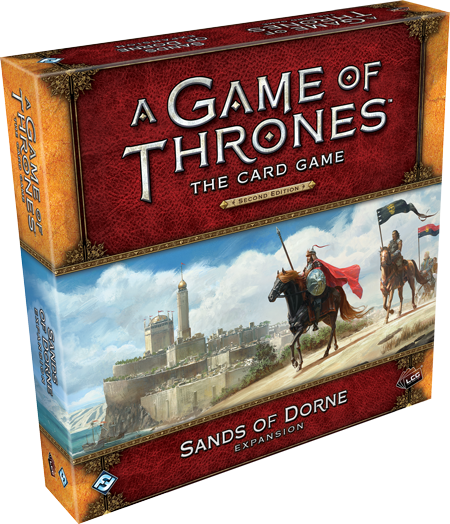 Fantasy Flight Games is proud to announce Sands of Dorne, the fifth deluxe expansion for A Game of Thrones: The Card Game! House Martell has waited long for vengeance. Seventeen years have passed since the death of Elia Martell at the hands of Ser Gregor Clegane and the invading Lannisters during Robert’s bloody rebellion. Over those long years, their hatred has festered and grown in the shadows. The Martells have been unable to quench their thirst for justice until now… and only blood can sate their appetites. Sands of Dorne is a deluxe expansion for A Game of Thrones: The Card Game, bringing House Martell squarely into the sunlight and giving them the cards they need to go toe-to-toe with any other faction in the game. Here, you’ll find powerful new versions of House Martell’s most iconic and dangerous characters, all intent on bloody revenge, including Doran Martell, The Red Viper, Ellaria Sand, Quentyn Martell, Nymeria Sand, and Areo Hotah. The power of House Martell is rising in the south, but far from the deserts of Dorne, the other Great Houses are also setting their plots into motion. 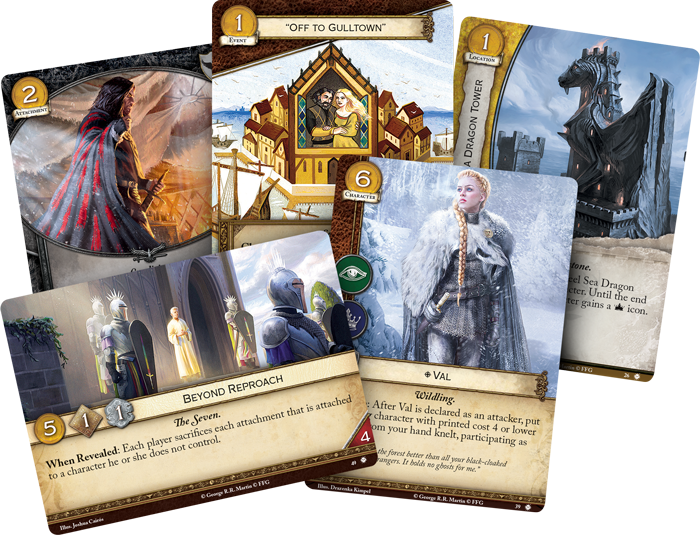 Every other faction in the game receives two new non-loyal cards in this deluxe expansion—and when that’s combined with a brand-new agenda and an assortment of neutral plots, Sands of Dorne promises to shake up the game like few other expansions can. You can pre-order Sands of Dorne at your local retailer or online through our website today; then, read on for more information! For much of the history of A Game of Thrones: The Card Game, House Martell has occupied an unusual spot. Though they have not been short of winning decks, their best decks often use unconventional strategies to win, such as combo decks harnessing The Red Viper (Core Set, 109) or heavy reset decks with Varys (Core Set, 29) and "The Last of the Giants" (Watchers on the Wall, 45). With the upcoming release of Sands of Dorne, however, House Martell gains a new caliber of character that can stand up to the best that other factions have to offer—while still staying true to their themes of vengeance and patience. Few Martell players will want to pass on the new version of Doran Martell (Sands of Dorne, 1). This loyal, seven-gold version of Doran Martell has a nearly unprecedented ability to control the game, exacting harsh vengeance on your opponent and opening holes for you to pursue your own schemes. Doran Martell offers an incredibly versatile Reaction. Whenever you lose a challenge—on attack or defense—you can trigger Doran Martell to choose any character. Until the end of the phase, that character gains or loses a challenge icon of your choice. The potential applications of this ability are nearly limitless. Stripping your opponent’s icons to control their board or punch holes in their defenses has long been a theme for House Martell, and Doran Martell is far the only new card in Sands of Dorne that plays to that theme. Even more than that, however, you can also grant icons to your own characters, helping to ensure you can win the challenges you need and making an agenda like The Lord of the Crossing (The King’s Peace, 60) more reliable than ever. It goes without saying that Doran Martell will be almost indispensable if you find yourself going up against another Martell deck that’s also removing your character’s icons. Removing and granting icons is powerful enough on its own, but Doran Martell also boasts another ability—as an Action, you can kneel your faction card to choose any participating character with one or no challenge icons and remove it from the current challenge. With the ability to push your opponent’s characters out of a challenge, you force your opponent to reconsider every attack or defense. 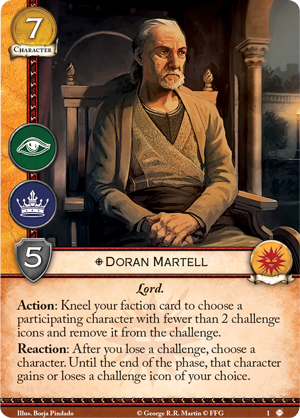 Like many of the best Martell cards, Doran can put your opponent into an impossible situation: lose the challenge and suffer claim or win the challenge and face the full wrath of House Martell. Rewards for losing challenges, like the ones that Doran Martell offers, are nothing strange for House Martell, with cards like Ghaston Grey (Core Set, 116), His Viper Eyes (Wolves of the North, 32), and The Long Plan (Taking the Black, 16) defining Martell strategies since the beginning. In Sands of Dorne, this theme expands as they gain one of their most powerful locations yet, and an answer to a chronic Martell problem: drawing enough cards to fuel their schemes. Dorne (Sands of Dorne, 17) is a four-gold location, but if you’re trying to keep your hand full of cards throughout the game, it’s worth every gold dragon. Dorne simply reads, “Reaction: After you lose a challenge, look at the top 2 cards of your deck. Add 1 to your hand, and place the other on the bottom of your deck.” In other words, every time you lose a challenge on attack or defense, you can do better than just drawing a card. Instead, you’ll look at two of your cards and choose the one that’s best for your current situation. 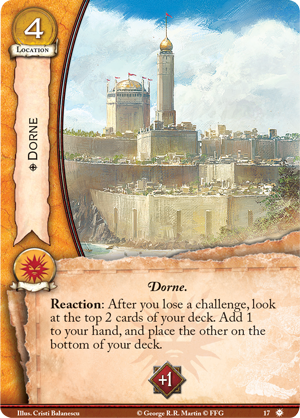 What’s more, Dorne boosts your plot’s reserve, letting you keep more cards in hand and softening the bite of low-reserve plots like Political Disaster (The Road to Winterfell, 40) and Retaliation (Watchers on the Wall, 47). In your quest for vengeance, the plots that you choose to include in your deck are one of the most important parts of your strategy, and some factions may think there would be little use for a plot that offers zero gold, zero initiative, zero claim, and zero reserve. Still, House Martell can find a use for even the most unusual plots, and At Prince Doran's Behest (Sands of Dorne, 46) is no different. This plot’s abysmal stats are actually immaterial—because it won’t be sticking around very long. 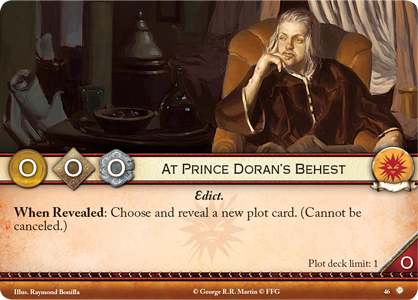 As its When Revealed effect, At Prince Doran’s Behest lets you choose and reveal a new plot! When you're playing the game of thrones, it’s easy to wish that you had full knowledge of your opponent's plot—and with At Prince Doran’s Behest, that wish becomes reality. Just as a single example, plots like Naval Superiority (Core Set, 17) or Forgotten Plans (True Steel, 119) become much more powerful when you can guarantee that they’ll successfully target your opponent’s plot. And that’s not even mentioning the plot-cycling effect of At Prince Doran’s Behest, since it essentially shrinks your plot deck and lets you reuse your plots faster. Though Martell steps fully into the sun with Sands of Dorne, every other faction also receives two new non-loyal cards, alongside an assortment of new neutral cards and plots. Characters like Missandei, Greatjon Umber, and Val enter the fray for the first time, and they may choose to take up arms against House Martell. 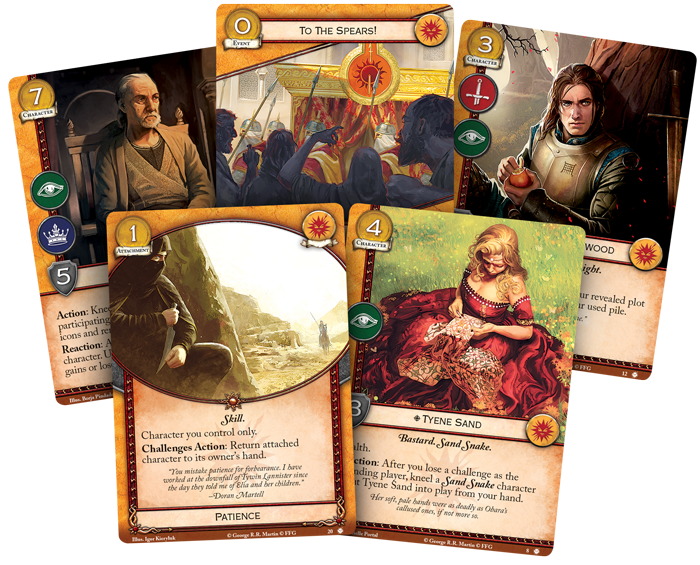 Indeed, several of the other cards in this deluxe expansion counter some of House Martell’s most potent strategies. The Martells have long prepared for their vengeance, laying secret schemes in motion behind the scenes to prepare for any eventuality. The Wars to Come essentially lets you do the same by preparing to face any foe. When building a deck, it’s common to wish you had room for certain plots, especially ones that counter specific archetypes. In the end, though, these plots are often cut to make room for more impactful cards. The Wars to Come gives you the slots you need to add those additional plots to your deck, favoring a more “toolbox” approach to the game. The downside to The Wars to Come is subtle—by committing to a ten-card plot deck, you’re less likely to cycle through your plot deck and use impactful plots again. In other words, your single copy of Valar Morghulis (There Is My Claim, 80) or a similar plot must sustain you for longer, because you won’t be able to play it again as quickly as if you had a standard, seven-card plot deck. Still, At Prince Doran’s Behest helps you to cycle through your plots more quickly, and of all the factions, House Martell has the most to gain from collecting a massive pile of used plots. 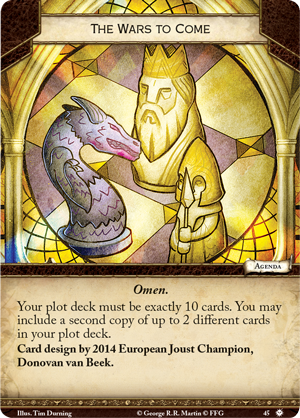 Obviously, with ten plots in your deck when using The Wars to Come, your plot deck's used pile can grow to new heights: up to eight plots in your used pile, or ten with a fully bestowed Ricasso (All Men Are Fools, 15) in play. 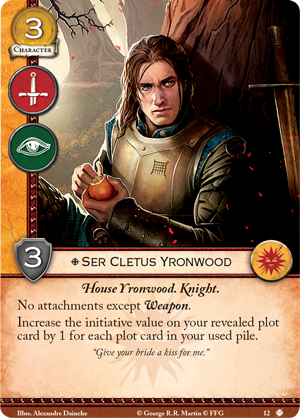 Correspondingly, cards like Secret Schemes (The Red Wedding, 76), The Prince's Plan (All Men Are Fools, 16), and Doran's Game (Core Set, 119) will grow in power, alongside new cards like Ser Cletus Yronwood (Sands of Dorne, 12). House Martell has long languished in darkness, but Sands of Dorne is their chance to finally exact terrible vengeance on the Seven Kingdoms that have long denied their justice. You can become the sun in the eyes, the viper striking at the heel, and the spear punching through heavy armor. Look for Sands of Dorne (GT30) in the first quarter of 2018! You can pre-order this deluxe expansion at your local retailer or online through our website today! Plein de choses intéressantes, ça va faire chauffer les cerveaux tous ces spoils ! j'adore doran , l'event patience , l'agenda , le complot martell ... j'adorrrrrrrrrrre ! et val , val avec jon ça va casser des gueules !!!! Ben l'agenda est quand même presque gratuit. Y a guère que le fait de cycler en 10 plutôt qu'en 7 qui serait un drawback donc bon, niveau équilibre. Val j'aime beaucoup aussi. Même l'agenda semble intéressant pour son côté toolbox ou pour avoir une used pile gonflée à bloc! Je comprends pas l'absence de drawback sur les agendas. Aucun intérêt. Pareil que dit précédemment. Un agenda non conditionnel, sans drawback avec un effet surpuissant permettant une capacité à s'adapter absolument phénoménale. J'étais absolument hypé jusqu'à cet agenda. C'est ce genre de carte qui risque de me faire quitter le jeu. C'est débile et dégénéré. "Ohlala, le drawback c'est que les complots "once per plotdeck" seront moins facilement cyclables"... Paye ton niveau de carddesign. Ils ont sorti le Plan de Marto !!! Rooohhhhh tellement bon tout ça ! Il n'y a rien à jeter. J'aurais préféré une deluxe Barath, mais les spoils font sacrément plaisir ! Si je comprends bien l'agenda, on doit avoir 10 plots, mais jusqu'à 2 seulement en double ? les illus déchirent, plein de trucs sympa. carte de champion carte à la con, à quoi il pense le mec? Perso à moins de vraiment vouloir rush via LOTC ou avoir sa boite à outil Castamere je ne vois aucune bonne raison de pas le jouer systématiquement. on s'arrache les cheveux sur le 7ème plot et le premier refoulé qui fait 8ème, là en 10 no comment. Le nouvel agenda va révolutionner le méta. 2 Heads onn Spikes + 2 Winter Festival!!!! Le plot martell combiné à cet agenda est tout aussi con, il facilite tellement la phase de plot et peut être fatal si bien joué (sous réserve des autres plots qu’on joue). Quoi? La lecture du jeu adverse? Pffff...Osef! Le plot Martell est ton ami. Jusqu'à présent tous les agenda avaient un drawback. Même Castamere, il informait le joueur adverse qu'il n'y avait pas de varys riddle en plotline principale, par exemple. Celui-là ... n'en a aucun. C'est débile à souhait, ils auraient du reprendre le concept de l'agenda V1 : "Forced Reaction : After one of your plot enter your used pile, your opponent gain one power", pour imiter le prized. Je plussoie, l'agenda est craqué (le drawback en fait c'est de pas pouvoir en jouer un autre...). J'ai juste l'impression qu'il veulent te forcer à choisir un agenda meme si y a rien qui correspond à ton deck... Si ils veulent inverser la tendance un jour les effets sans a vont avoir intérêt à être particulièrement badass. Bah tu sais que certains plots ne te feront pas chier en complot, ca reste mince, mais ca reste une information que tu donnes à ton adversaire. Sinon, totalement fan de Doran, bien mieux pensé que Mace qui peut auto-win tout seul sans rien faire, bon controle de défi dans ce que le Martell fait de mieux, péter les icones, et on ne peut pas faire Doran et l'event de pioche dans le même tour. 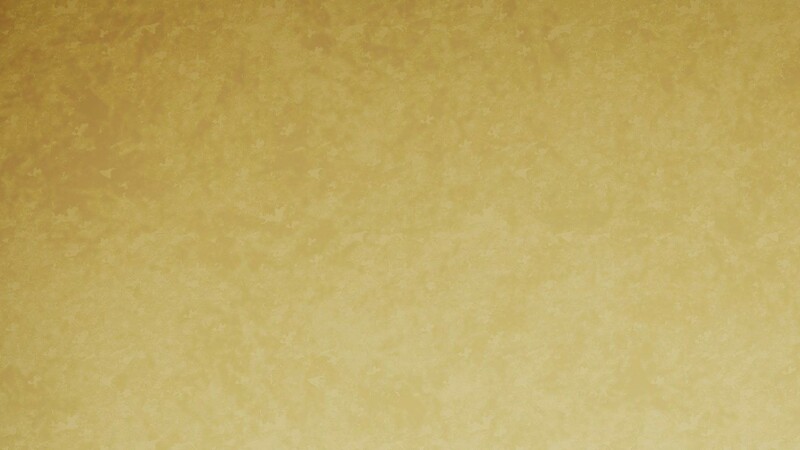 Le plot Martell c'est n'importe quoi... sérieux y'a t'il un seul cas où il est pas bon??? Oui, quand tu le joues pas. Et certainement bien d'autres trucs décérébré. Et le plot Martell va permettre de "cycler" plus vite cet agenda tout en faisant bénéficier à la faction d'un "used" plot de plus rapide et facile à faire.